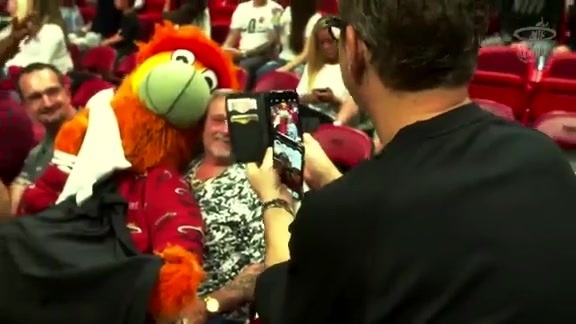 Burnie is the mascot of the Miami HEAT. You can find him at every HEAT home game making his way all over the arena, bringing his high energy to the fans. 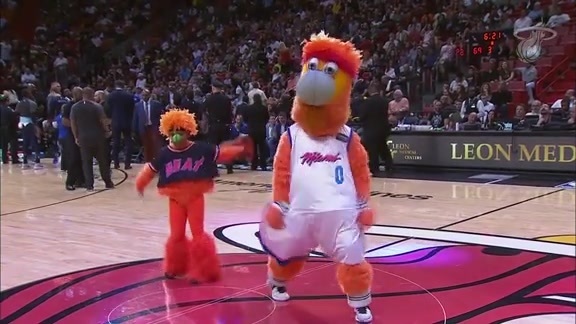 And on occasion, Burnie joins the Miami HEAT Dancers for a routine or two. Burnie the HEAT Mascot are available for a wide variety of private appearances. From corporate business receptions to trade shows to Bar or Bat Mitzvahs, Burnie is sure to bring the heat! To have Burnie appear at your function, please call (786) 777-4107. This contact information is to be used for Burnie booking inquiries only. Unsolicited emails and/or phone calls will NOT be returned. Burnie performs to Beyonce's Single Ladies (Put A Ring On It) during a game. Becoming a HEATLifer has no starting age, give your kids the joy of painting with the Miami HEAT by downloading these Burnie Coloring pages. Click the download button below each image to get a printable version of each image.